One day after suffering a road loss to the Tampa Bay Buccaneers, the Philadelphia Eagles got some good news. Quarterback Carson Wentz has been officially cleared for contact following last year’s knee injury. Eagles head coach Doug Pederson has already announced that Wentz will be the starter in Week 3 when the Eagles play the Indianapolis Colts. 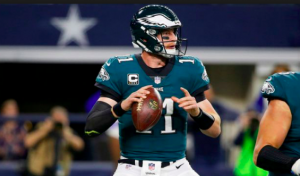 Wentz was having an MVP-caliber season in 2017 until suffering a tear of the ACL and LCL in his left knee in December. The injury forced him to miss Philadelphia’s Super Bowl run. Of course, the Eagles were able to win their first ever Super Bowl behind backup Nick Foles. The Eagles spent the entire offseason hopeful but unsure if Wentz would be back in time for Week 1. Despite being able to do some work on the practice field, Wentz wasn’t cleared for full contact until now. The declaration that Wentz is ready for full contact comes just over nine months after the injury. After his Super Bowl heroics, Foles continued as the starter for the first two weeks of the season, albeit with mixed results. The Eagles beat the Falcons in Week 1 despite Foles only throwing for 117 yards. On Sunday, Foles threw for over 300 yards and a touchdown against the Bucs but couldn’t lead the Eagles to victory on the road. Foles will now return to being Philadelphia’s backup after a job well done. Pederson acknowledged that it could take time for Wentz to shake off some rust and get accustomed to the speed of the game. However, Pederson is confident that Wentz is mentally prepared to return. Pederson also says he won’t be thinking about Wentz’s injury when it comes to calling plays. However, one thing that could hamper Wentz is the team’s situation at wide receiver. Alshon Jeffery has missed the first two games due to injury while Mike Wallace was just lost for a significant period of time with a broken fibula. Outside of Nelson Agholor and tight end Zach Ertz, the Eagles don’t have many proven receivers. Regardless of the situation at wide receiver, the Eagles will be thrilled to have Wentz back. From top to bottom, the Eagles are as strong as any team in the NFL. But Wentz was one of the best quarterbacks in the league last season before his injury. If he returns to full health, there’s every reason to expect the Eagles will once again be a legitimate Super Bowl contender.